Silver: the current Monopoly token lineup. Gold: new tokens up for a chance at board game fame. In 2013, fans voted to replace Monopoly’s classic iron token with a cat. Now Hasbro is prepared to replace the entire token lineup based on the whims of internet voters. What hope do wheelbarrow and thimble have in the face of computer, t-rex and helicopter? Monopoly tokens have come and gone since the classic board game made its commercial debut in the 1930s, but this is ridiculous. Today Hasbro launches the Monopoly Token Madness Vote, in which fans can visit VoteMonopoly.com and select which eight of the tokens pictured above they’d like to see in the next generation of the storied financial board game. 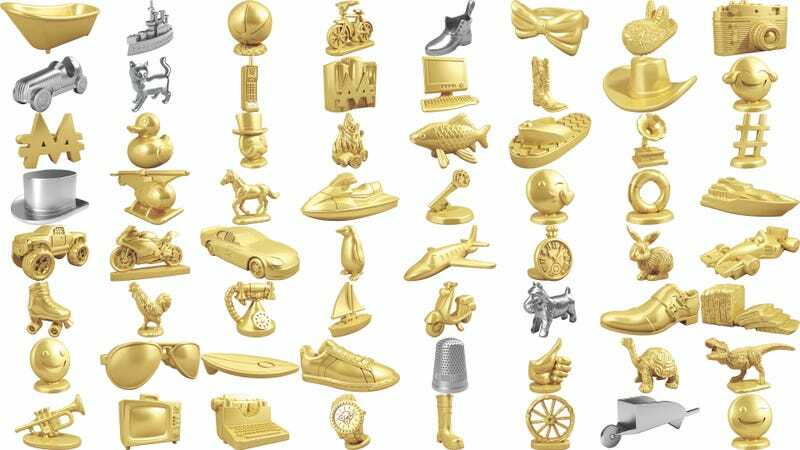 Hasbro sent along a Token Madness version of Monopoly, featuring the eight current tokens in solver and gold bunny slipper, rubber ducky, Mr. Monopoly Emoji, penguin, F1 race car, wristwatch, television and wheel tokens. Again, no tokens are safe here. All eight of the current crop could be replaced with any of the new ones, a mix of vehicles, footwear, emojis and animals. Could this be the end of the top hat and Scottie dog? The winning eight will be announced on World Monopoly Day, March 19, with the new version of the board game featuring the fan-voted tokens arriving on store shelves in August.